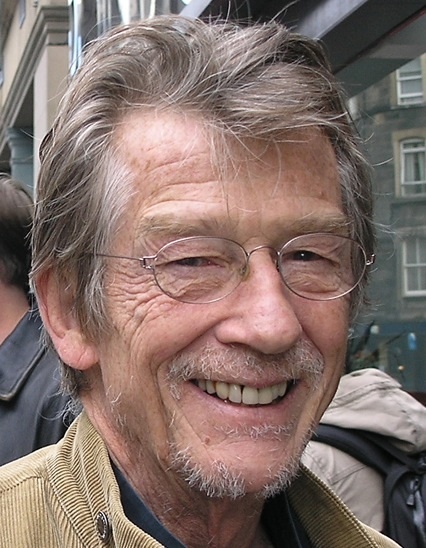 Oscar winning actor John Hurt shared his opinions on film, inspiration, and links, at the special ‘Movie Talk’ event at this years Rome Film Festival. Hurt is one of the greatest screen legends to steal the show. I feel privileged to have attended. Both big screen and treading the boards, his extraordinary career has seen him work alongside Laurence Olivier, Orson Welles, and Richard Burton. A humble one pound a week funding saw him through rough times as he was mastering his craft at RADA. From starvation to stardom, Hurt managed to achieve an Oscar for ‘Best Supporting Actor’ for his role in Midnight Express, and numerous other BAFTA awards, including an outstanding British Contribution to Cinema Award at the 2012 BAFTA’s in recognition of his incredible range of roles in a career spanning six decades. Here’s what he had to say, with questions fired from all directions, an eager audience, and a staged open forum, up for discussion and random debate. On the subject of working relationships. Who do you choose to work with and what makes you choose a role? I go with my gut instinct. I would not question Lars von Trier if he asked me to work with him, I would say yes immediately. The more experience one has as an actor the more difficult it becomes to make choices. One can only rely on instinct, yet it changes as one gets older. The choices become harder as one gets older. Take someone like Beethoven. His early music being more spontaneous. Whereas his later works were more thought about, wise, and lulled over. Not that I am by any stretch likening myself to Beethoven. And on occasion, the bank balance makes choices for you. Are you a fan of Independent films? I love independent films, interesting scripts and directors. The Field and The Hit are films I am passionately fond of. Thats what is great about my latest film, Snow piercer. It is esoteric but it also has the commercial possibilities and blockbuster-mania of a wider audience at the same time. The director, Bong Joon-ho, summoned me to a Soho hotel and insisted I was right for the role. He’s fantastic. He shoots what he wants to see precisely on screen. He’s almost a Hitchcock’s Hitchcock. It was seeing Alec Guinness as Fagin in Oliver Twist that ignited my infatuation for acting. I saw every single gesture and move of Guinness as perfection, it was enormously influential. Shortly after, aged nine, I played a girl in a school play of Bluebird and had the extraordinary feeling that I was in the right place. That feeling never left me. My parents did not want me to become an actor. After the war, the most important things were respectability and security, none of which one associates with acting. My parents sent me to art school because they thought I could become an art teacher. It was not until my clergyman father went into the mission field, that I realised this was my chance to get into acting. He laughs about how, humorously, it was a rather unsavory fast food joint that he recalls, led him to his fate. Were you a RADA student in London during the Swinging Sixties? Hurt was famously nominated for a Best Actor Oscar for his role as Joseph Merrick in Elephant Man, but the award went to Christopher Walken for Deer Hunter. Do you think theatre will die out? Just as he said that, an Italian man hysterically shouted over to him asking him to read his script. Clearly someone else went with their instinct, and you never know, he could be a future ‘link’. I think his epitaph should say, from link to legend. Look out for Snow Piercer, in cinemas soon. This entry was posted in INTERVIEWS, ITALY, ROME. Bookmark the permalink.